Some of the franchise owners are downright shady characters like Vijay Mallya (RCB) and N. Srinivasan (CSK). Mallya is running like a fugitive in UK as he has defrauded Indian public sector bankers (funded by Indian tax payer) to the tune of about Rs 9,000 Crore. (approx USD 141.3 Million). bolero wrote: Some of the franchise owners are downright shady characters like Vijay Mallya (RCB) and N. Srinivasan (CSK). Yes, but in and outflows are much less complicated. Allan Stanford could own a team. But regardless,for money laundering, there must be money being "washed" and presumably a rational reason to "wash" it which is illicit funds made to look legit. If its to beat tax, that is tax fraud. I see an analogy to movie making in Hollywood. A Producer calls the shots. director & actors/actresses follow what the money bags say. An actor has no say on who the movie is made. He or she cannot demand % of movie profit unless they are A grade with contract pre-written, a rarity. It does not work that way esp in india. All movies in india are hero centric. lead actresses get 10% or even less than lead actors. director gets half or less than lead actor. entire movie is run by wishes and whims of that lead actor including cast selection & location what not. Cricket players like Ganguly or Kohli can demand and get coaches and team players to his liking. But thankfully such players are limited, definitely not a foreign player dream of calling shots in IPL. Otherwise, Cricket is entirely management driven jealously guarded business where players have no say. IPL teams have 50% non cricketing reasons to select each player they select. And now NZ Cricket Players' Association is complaining about the auction process, calling it humiliating to players. "Being paraded like cattle for all the world to see". IPL is valued at $5.3 billions. It is about 7 % of New Zealand national annual budget ($ 78 billions) and 12 % of Pakistan's national annual budget ($ 47 billions). So there ! squarecut wrote: IPL is valued at $5.3 billions. It is about 7 % of New Zealand national annual budget ($ 78 billions) and 12 % of Pakistan's national annual budget ($ 47 billions). So there ! Why not deal with the merits of Mills' argument instead of pointing out NZ has a low population and therefore Budget? Part of the IPL's great value is the competitiveness of the tournament. This is greatly aided by the Salary Cap. If Mills values increased player privacy, behind closed door negotiations is best. But in a salary cap environment, this is often abused with deliberate cheating by the clubs, giving the cheating clubs an advantage over non-cheating or cheating less clubs which the players may or may not be aware of. The Auction eliminates salary cap abuse. Negotiations also favour popular franchises, ones that players will take less for, be it a popular geographical location, past success of winning games, stronger roster for the next season, or just where their friends are playing, and taking less money to play for that franchise. Conversely, it disadvantages unpopular clubs, continued weak results, poor geographical location, weak next season rosters, etc. Another option would be a draft. But this is still public and creates embarrassment for players expected to go early in a draft, or then get picked late or not at all. The draft is a big public event in USA sports for initial players, and while the top few players know where they'll be heading, if there's a surprise or 2 in a draft early, this has ripple effects for the rest of the rounds. There's only 8 IPL clubs, so all players know its one of 8, or none at all. What has been taken away from the player is the autonomy of bargaining a deal with a specific franchise, negotiating in privacy until an agreement is reached. This is slightly more uncommon for the players. But the IPL is not a full year commitment. It isn't even a 6 month commitment. It is a 2 month commitment, with only 8 franchises. If a player does not want to play for a franchise, he doesn't have to turn up and play. The player could publicly state before the Auction," I hope not to play for" whatever franchise that he does not want to. This will certainly deter bids I am sure. So while Mills makes a fair point that players are subject to greater public scrutiny in the Auction, it does remove the salary cap cheat aspect. Mills may want to look at his own national contracts, which normally leave someone not on the list of 20 feeling a bit embarrassed. And the auction gives total transparency, while a the precise ordering of the National lists is not always made public. Mills may say this respects those who have slipped down in a year. Well that is possibly very beneficial to the self esteem of that particular player. But NZC is not operating in a salary cap environment for its national team. So there is an opportunity cost to be made. The IPL clearly values competitiveness over the 8 clubs more than it values fans getting attached to loyal and long standing clubmen (but it has tried for a middle ground with limited retention and right to match). They want the viewing public's continued fan support of teams, thus the all teams themselves, to give themselves the chance at building a strong roster, to the point of overhauling it entirely in 2018. If Mills or anyone else has an alternative that remains so effective and promoting the salary cap's effectiveness, lets hear it. Last edited by Paddles on Thu Feb 01, 2018 1:27 pm, edited 5 times in total. It is a private league run by a private organisation of India. Mills has no locus standi in this matter. He is expressing his opinion, just like many others. If big money was not involved then we would not hear such comments. Actually, the BCCI is not a private organisation. It is a public charity and gets tax cuts in India accordingly as well as performing a public function. But regardless, Heath Mills lives in NZ, where he has the right of "freedom of expression". That gives him the right to say whatever he wants to on anything subject to defamatory and criminal restrictions. For example, he is free to criticize a private enterprise like coca cola and its production practices being possibly detrimental and negatively impacting on Indian farmers should he wish to. Likewise, he is free to criticize Somalian pirate enterprises for not giving junior pirates fair pay or safe workplaces if this is an issue that is of annoyance to him. In fact, criticism of sweatshops run by foreign corporations has become all together quite common by Western countires. So have questions of fair trade where employees on coffee, tea and cocoa fields have been very lowly paid. So foreign employment practices are far from taboo, especially if involving one's own countrymen. As for locus standi, I don't believe Mills is threatening action on behalf of NZ players under GATT or at WTO/ILO just yet. But I am sure standing would be determined early, one way or another. But I don't see it getting on the ticket to be heard that quickly given what these cricketers are getting paid. I'm pretty sure the NZ players would not support any legal attempts to force a change should Mills trying to make an undertaking in his official capacity. Welcome to globalization. Almost everyone has a negative opinion about something occurring on foreign ground. squarecut wrote: If big money was not involved then we would not hear such comments. Well, this may or may not be true. BBL is far less money, and still is news for cricket fans in NZ. I believe it is far better to debate the merits. The auction prevents salary cap rorts. Something the NRL in Australia (and USA sports) with private franchise ownership (like the IPL) with its private player negotiations has completely failed to do. This can leave a player embroiled in controversy, that they may have had no hand at all in creating. Mills see's the con's. Perhaps someone ought to debate the pro's with him. Or perhaps he is angling for the BCCI to own all the franchise and eliminate private franchise ownership? Or wishes for NZC to keep ownership over our domestic teams. I doubt it is either of these, but if so, that then becomes a different debate altogether. One of the things I like about the IPL is its competitiveness. We've seen that in almost every season. Anything that could undermine it would be a big no-no from me. As for players "being paraded like sheep", is it such a big deal? The transparency of an auction versus so-called "dignity of players" - I'd pick transparency every time. Even if I were a player, to be honest. It enhances the credibility of the product - which, in turn, enhances the stature of all involved. The IPL has already been mired in all sorts of controversies from day one. Even today, the ownership of franchises often raises eyebrows. You have a face (often a celeb) but whose money is actually being rolled (some would say laundered)? In this context, anything the IPL can do to further transparency must be welcomed. I don't know how popular Mills' opinion would be amongst players themselves. Sure, some players might like to play for franchise A instead of franchise B - but, like Paddles says, if they're so particular about this, there are ways to send out signals before the auction. It's a point-of-view that Mills has expressed - and I can see where he's coming from. Players are not used to being treated like cattle - and, on the surface, it does seem to be a bit like that. But is it really as bad as he makes it sound? One of the things that worries me that none of you guys have touched upon his underworld or mafia money coming into IPL. The system is not transparent. It is rumoured that D-Company has also put cash in IPL through the franchises. D - Company (for people who are not aware) is controlled by Dawood Ibrahim, a terrorist (born in India , but fled to Pakistan and is protected by their intelligence) - Prime suspect in Mumbai 1993 Bomb Blasts which targetted Air India building, Sena Bhavan in 13 co-ordinated strikes and killed 257 people, injured about 700 people. D Company, besides terror is involved in hawala (illegal money transfer), money laundering, smuggling, drugs, betting mafia, into film making and so on. If D Company has its money in IPL, I am sure they are involved in spot fixing and other undesirable activities. bolero wrote: One of the things that worries me that none of you guys have touched upon his underworld or mafia money coming into IPL. Well the way to most greatly cease concerns of terrorist or mafia involvement in private franchise ownership and to retain tournament play competitiveness, is to end private franchise ownership, a point I alluded to previously. But this has further pitfalls. And spot fixing could still occur with 3rd parties dealing with the players, be it bookies, further players, etc. raja wrote: It's a point-of-view that Mills has expressed - and I can see where he's coming from. Mills I think is possibly lacking the big picture, and hasn't looked at and assessed the merits from a variety of angles. And I suspect he is far too caught up in the central funding of NZ domestic cricket leaving teams with similar budgets and thus fairly similarly competitive, to question further private funding or preferred teams, for whatever reason, to play for. Lack of competitiveness has happened in NZ sport before, our rugby NPC for years was a one horse race with Auckland putting out the best team year after year in an amateur era. His job is to look after NZ cricket players, and he probably feels that the existing system isn't doing this compared to how Australian players are getting treated. But what system would? And what costs would it come with? Last edited by Paddles on Thu Feb 01, 2018 11:53 am, edited 4 times in total. Oh, D-Company or not, there's certainly a lot of murkiness about the IPL. I'd like much more transparency than just the auction process. Somebody once said, there's a reason big FMCG multinationals like Unilever and ITC have not gone into IPL franchisee business. Not that they could not have floated a firm for this purpose - like Ambani did. It just does not fit into their way of thinking - compared to BCCI/IPL's way of thinking. raja wrote: Oh, D-Company or not, there's certainly a lot of murkiness about the IPL. I find the IPL auction quite interesting, the winners and the losers. I understand that if say someone like Martin Guptill isn't a fan, and as amazing as has been for NZC, and an ATG of our limited overs cricket, he just hasn't performed consistently in India. And more inferior players than himself have more often, or have cool nicknames like "The Big Show". Martin Guptill himself to his credit has remained quiet on the issue. There is a big deal about Sodhi not selling despite being the leading t20 bowler in the world. And he certainly has performed in India before. But with only 4 foreign spots per team, specialist spinners who bat tail end and aren't the best in the field, that's not a high in demand prospect in a country that produce so much spinning talent itself that Amit Mishra has missed so many games. Narine himself is bringing a batting option these days and is a proven IPL performer, Badree has missed plenty of IPL games, Rash Khan is going from strength to strength super starring last year, and Shakib and Nabi are allrounders. I'm neither shocked nor think its a big deal that Sodhi missed out. Unlucky that he missed his chance last year to Rash Khan to now be an establised IPL superstar, maybe. But Khan is now a star, and its not like Sodhi has to question why Zampa is being sold ahead of him again. There definitely is an issue with Aus player treatment vis a vis NZ player treatment by the IPL. But NZC needs to raise its profile in India to more closely that of Australian cricket. We got domestic t20 games into India this year, but the host broadcaster filmed much fewer games compared to the BBL coverage of every single game. NZC should further demand and try to negotiate that India reciprocate more on tours of late. There's things that NZC could be doing to help alleviate what is causing a lot of upset. Plenty of NZ bowlers were given a chance last year, not many shot the lights out. And Afghanistan's and Bangladesh's rise coupled with further English involvement means there's less international spots. A lot of Indians love cricket. And there's a lot of good talented Kiwis playing good cricket. How about NZC look at how to increase their exposure and profile to Indians, instead of complaining about the IPL auction process? Play India at home more often. Beat India in India more often (no mean feat, but even more individual starring performances would help). Broadcast more matches, both domestic and international, and get them into India more often. Sadly for Sodhi, at 25, he may financially be better off moving to India, and trying to meet the requirement of a domestic IPL player. He really ought to look into the requirements to see whether its instant or a 4 year like international stand down. Plenty of NZ players have chosen England county over part time National selection. It is no different really. Last edited by Paddles on Fri Feb 02, 2018 12:15 pm, edited 4 times in total. Here's another Kiwi, with a different perspective to Mills. Gotta say, I personally almost entirely agree* with Mark Geenty, not Heath Mills. Not that Heath Mills isn't entitled to an opinion. OPINION: Not much makes sense when you're talking the Indian Premier League auction. But people love to talk about it. It's a unique, unpredictable lottery involving the world's top cricketers, which places a dollar value on them and makes it utterly compelling. Some add an instant seven-figure sum to their annual earnings and others, mystifyingly, miss out, or go for well under their perceived value. But "repugnant" and "revolting", as appeared in headlines this week? And "humiliating", in an actual quote from New Zealand's Cricket Players Association boss, Heath Mills? One former cricket administrator even labelled it "undignified" and "cruel", evoking images of cattle trucks arriving at Eden Park, into which our poor, unsuspecting Black Caps would be crammed then transported to a potentially horrific fate. I find it difficult to believe our top players are such delicate flowers they need protection from this heinous crime against cricket. They're hardened to the highest pressure of competition before a packed house. They willingly enter the lottery, knowing full well its randomness, but with a chance, however slim, they could hit the jackpot. 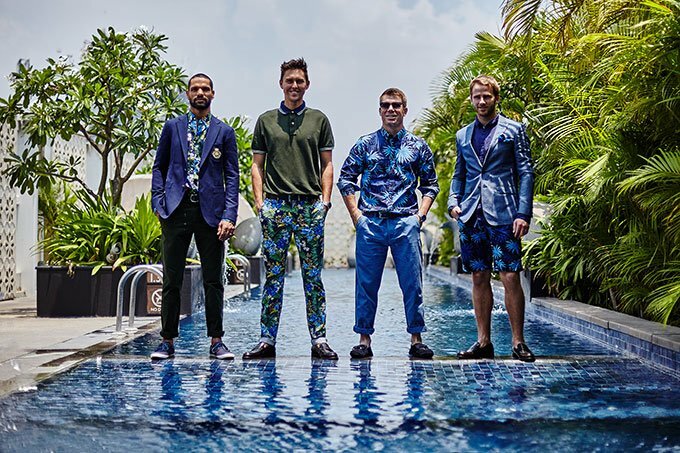 For starters, no players were even present at the Ritz-Carlton in Bangalore as Stephen Fleming, clad in striking traditional Indian wear, and Daniel Vettori, more casual in a team t-shirt, raised their respective paddles in competition with the other six franchises including Bollywood stars and billionaires. Compare that to the National Football League (NFL) draft, where just over half the predicted top-32 picks sit backstage in the green room as television catches their every reaction. Some strike instant fame and fortune; others sit for hours, verging on tears, a camera in their face as they're ignored and rival players get picked up. That seems the definition of sporting humiliation, as they cling to hope for their big break. For the high-profile cricketers who missed out at the auction, like Martin Guptill or England captains Eoin Morgan and Joe Root, they're among their country's highest paid on annual retainers and match fees, also able to ply their trade in other smaller Twenty20 leagues. Mills is a good administrator who's fought tooth and nail for his players for 15-plus years, and continues to do so. Just seven of the 24 New Zealand hopefuls got picked up, which seemed low, and some rightly expressed their disappointment and frustration. Mitchell McClenaghan, Ish Sodhi and Guptill were unlucky; Colin Munro and Trent Boult both looked under-valued at under NZ$500,000. Australian players were exceedingly more popular, with seven of them among the 13 instant overseas millionaires, aside from Steve Smith and David Warner who were already retained. Mills had a point in one respect that the IPL auction has become more interesting than the tournament itself to the casual onlooker. Thousands followed Stuff's live coverage of the two-day auction, eager to see how the New Zealanders were valued, musing about the politics or whatever else behind the scenes, and debating the non-selections of Guptill or Sodhi, or the $1.9 million fetched by Australian allrounder Glenn Maxwell. The IPL itself is played in the middle of the New Zealand autumn nights, on pitches of variable quality and gets only passing interest unless a Black Cap does brilliantly well or a Chris Gayle or Chris Lynn does something spectacular. During rare late night viewing moments last year some of the basic catching was woeful. For better or worse, this IPL auction is pure sporting theatre, off the field. And it's professional sport, too, with franchise owners entitled to bid for who they like, whatever their motivation. There will be winners and losers, it may be hard for some to take but it won't be career-ending. If the auctioneer could only speed things up like the highly efficient motor-mouths at the Karaka yearling sales it would be even more watchable and compelling. Long may the circus continue. *Subject to the sentence in bold being a bit overstated. I was not convinced that any of these 3 would be bought this IPL. Guptill has been unluckier in the past, Mitch's BBL form was not good and his 2017 IPL ER, despite his wickets was not entirely special to displace his recent BBL high ER form again, and Sodhi is a tail end batsman spinner who is not great in the field, looking for a job in India, where they are a dime a dozen. Boult went for a lot less than last time, but he wasn't able to secure a starting position every game last time. With just 7 games at over 9's in 2 seasons, with just 6 wickets, how much did Boult expect to earn at the auction? He's had his intl form big payday, he now needs to start chalking up some IPL value. Munro as a batting opener for NZ and form in the CPLT20 resets a lot of what he has done, or not done previously in the IPL. I think many agree he went cheaper than he may have gotten. But I am sure he will happily bank his IPL cheque. As will Boult for that matter. Lets just hope Heath Mills doesn't see what the IPL franchises then do to Auction player winners if he has an issue with cricket stars being paraded around like cattle in exchange for being paid big money. yes, spinners are dime a dozen in india. Every other batsman is a part time spinner & you only need a bowler for 4 overs and any two good batsmen can spare 2 overs each. Teams try to suit up more batsmen in the final 11 at the expense of second genuine spinner. India sure lack killer genuine fast bowlers that are disciplined and would always be in demand for them compared to foreign spinners. Going South wrote: yes, spinners are dime a dozen in india. Every other batsman is a part time spinner & you only need a bowler for 4 overs and any two good batsmen can spare 2 overs each. Teams try to suit up more batsmen in the final 11 at the expense of second genuine spinner. India sure lack killer genuine fast bowlers that are disciplined and would always be in demand for them compared to foreign spinners. I agree about so many Indian batsmen being useful part time spinners, and the teams buy a lot of foreign fast bowlers compared to foreign spinners, but if they're not special death bowlers like Malinga, Starc, Bravo (he's an ar but his bowling talent qualifies here) and Mustafizur, they normally make way for allrounders and intl batsmen as teams try to get their balance sorted. Right from the early days, McGrath was benched. Even Mistafizur and Malinga got benched last year, Mustafizur a lot. IPL ends up valuing intl AR, particularly seamers, and intl batsmen who hit a lot of boundaries the most. Just the way it is - they're the rarest gems not produced en masse locally and teams want to stack them in between Indian batsmanship and bowling options. None of the above explains Steve Smith going for millions, though. But he may yet get benched himself. A lot of it is scouting, agents, marketing et al. Australia seem to be much sharper than NZ in this respect. I heard a lot of Aussie names for the first time only in the IPL. Ryan Harris, Dan Christian, Aaron Finch, Ben Cutting etc. I don't even know what the NZ T20 tournament is called but maybe that needs to be made more high-profile too. The Big Bash is the second-most prominent T20 league out there, next only to the IPL. Until NZ raise their profile, their players are going to be second fiddle to Aussies. If they have a high-profile tourney, and a lot of Kiwis (not necessarily international players) get to be heard of outside NZ, we might see more names making their way into the IPL auction. Even the Caribbean PL probably has a higher profile than the NZ one. raja wrote: A lot of it is scouting, agents, marketing et al. This will help but won't do as much as getting India to tour NZ or NZ players starring in India in internationals and winning there. It is NZ internationals missing out or cheap who by and large will be on intl duty during the Super Smash. Sodhi is slightly different in that he has been dropped from formats longer than t20. NZC just needs to start raising its global profile full stop. There is good high quality cricket being played in NZ at the moment, the visiting intls at both domestic and intl levels prove this, this season and several more preceeding. So start making people aware of it. one good thing about IPL is that it’s brutally honest in player assessment & future bid pricing if a player does not perform even though they are bought at higher price bracket. perform or perish is the mantra strictly followed to the letter. This would give you the fan a more competitive performance from players as every action on field now seen through magnifying glass and there go your “future millions” for today’s lax/stupid performance. I like that “accountability”. Even rock star BCCI players with cult following is no exception. LOVE IT. Going South wrote: one good thing about IPL is that it’s brutally honest in player assessment & future bid pricing if a player does not perform even though they are bought at higher price bracket. perform or perish is the mantra strictly followed to the letter. This would give you the fan a more competitive performance from players as every action on field now seen through magnifying glass and there go your “future millions” for today’s lax/stupid performance. I like that “accountability”. Even rock star BCCI players with cult following is no exception. LOVE IT. Glenn Maxwell and Steve Smith called and said that they totally agree with you. Yes, BCCI touring NZ more often would help. NZ cricket - and players - need much more visibility. I don't watch much TV but the other day I saw a women's cricket match going on - am pretty sure it was women's Big Bash. I don't think NZ cricket is on TV here in India. Australians and Aussie TV media seem to be much more aggressive in promoting their sports / players than NZ is. raja wrote: Yes, BCCI touring NZ more often would help. That's partially previously explained because an Australian billionaire is the one creaming the Indian Pay TV cricket market. It was pretty easy for him to do, especially when Fox had the Big Bash in Australia. NZ definitely has signed up broadcast deals that get to India, but not as mainstream as Fox. But most our t20 games don't even have a film crew. NZ were previously fed into India via Sony, but they didn't even broadcast the NZ-AUS in NZ ranked 1 and 2 Chappell Hadlee ODI series I am led to believe by Ravi Ashwin who was appalled. Interestingly Cricket Australia is now with Sony. NZ has a host broadcaster who has a reputation for penny pinching. It charges hefty subscription fees, but would rather broadcast ready made BBL content from Australia than pay a film crew to cover our local games it would seem. They penny pinched on hotspot in the last T20 series NZ played in. Noone noticed until Ross Taylor was dismissed adamant he hadn't hit the ball. Most the domestic level games broadcast are without the use of a speed radar gun. Seriously. When NZ toured South Africa for ODI's last, the South African broadcaster found the NZ broadcaster's offer to be so low, even after further negotiations, they gave it to NZ'ers for free via an internet stream. I presume at their own expense. I'm not saying that this is the case, but the host pay broadcaster may have good rational reasons for doing this. Because with the overseas markets so profitable once a demand is established, the host Cricket Union will not be so reliant on the highest local bid. Once the overseaqs bids are so big, it is more about who can do a good job providing the coverage so that the demand continues. Suddenly local FTA becomes sustainable, (I read CA didn't push FoxPAyTV to beat FTA Ch 9's offer for internationals and FTA Ch10's for BBL because it wants it product on FTA locally) like it is in Australia and India. That wouldn't be a position of strength for the Pay TV Broadcaster who needs a monopoly on live sports to stay afloat. So until the Host Cricket Board is prepared to let someone else provide the coverage of the games, it could be losing out more on a more valuable market than a mere 4.5m people. Put simply, if it keeps global demand for NZC small, it can retain its monopoly in NZ because no existing free to air broadcaster has the means to pay for and broadcast these games before a global demand is created. NZC can do deal with any broadcaster, as to their reimbursement for the coverage costs that it then onsells. The broadcast isn't just the game, but their commentary, camera work, graphics, etc. Hopefully, as a consumer, Netflix or Amazon take an interest in NZ sports soon and NZC chiefs open their minds further to the global world than merely crying foul that some players went cheap or didn't sell at all. Because I am not a fan of the monopoly situation in NZ at the moment, which just isn't providing what is demanded and paid highly for by NZ Cricket fans. The sad thing is, cricket is a sport that attracts plenty of people with the right acumen to make things happen. Especially those recently retired from corporate careers, but not yet finished altogether as career salaries at NZC will not be as attractive as corporate work. But they are not always past international players themselves. Which does seem to mean a lot for high roles in NZC - bar coach, funnily enough (and one I don't mind at all as he is doing very well). i predict SUPERMAN maxwell & steve smith would be “explosive” in this IPL. unadkat would be a super bust. no takers for next IPL or paltry with 70% drop in price. i also don’t expect much from raina, sunil narine, h pandya, stokes, manish pandey, chris lynn, krunal pandya, sanju samson, chris woakes, andrew tye from the big paycheck boys. Going South wrote: i predict SUPERMAN maxwell & steve smith would be “explosive” in this IPL. Sounds like you have your IHAG sorted. Lets see how your prediction goes after the IPL. This latest match fixing investigation tape put out by Al Jazeera pretty much substantiates my D company fear. Congrats to Ish Sodhi for being the most economical bowler this IPL after finally being selected halfway through the tournament.